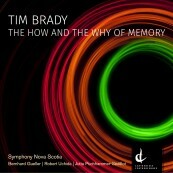 We recently caught up with Canadian composer Tim Brady about his newest CD release, The How and Why of Memory, featuring Symphony Nova Scotia. The CD project began in 2010, when Symphony Nova Scotia played a short piece of mine called “3 or 4 Days After the Death of Kurt Cobain”. They really liked the piece, I liked the performance, so we said – let’s do some more music together! Eventually, I wrote the Violin Concerto for [Symphony Nova Scotia Concertmaster] Robert Uchida and it was premiered in 2012. We decided to record it, just in case, though we had no idea of releasing it at all. But they played so well, we decided we really had to put it out. So we looked at other pieces, and my Viola Concerto and Symphony no. 4 (which were both on the composition table at the time!) seemed like a good fit. Then we had to find a lot of money… but it worked out. What was the process like of creating a record with an orchestra? Working with Symphony Nova Scotia is fantastic – everyone is so professional, so committed, so friendly. All my other records are studio projects; doing a live recording was more stressful for the players, but, in fact easier for me (as producer!). From your point of view, what’s exciting about this record? What I love about this record is the scope of the sounds that an orchestra can make. That is the magic of it – 45 players, all with different colours, different voices, different sounds and personalities. The intensity of communication of a great orchestra like Symphony Nova Scotia is quite magic. Very few Canadian composers get to explore orchestral performance and recording in this depth, and I am very lucky to have built this collaboration. Composing for orchestra is very demanding, but very rewarding, and having an amazing recording like this is fantastic. How would you describe the music on this record? What can listeners expect? As they say, “Talking about music is like dancing about architecture!” I never know how to describe the sound of my music. The music is often trance-like, or hypnotic, or has a rhythmic groove, or full of drama, playing with tension and release. And I am a sucker for the odd good melody… but just at the right time! The ideal is to appreciate the sound in the moment, but let yourself feel the large-scale flow of time. To make time stand still – to just be. The record is available at symphonynovascotia.ca, iTunes, and amazon.ca. It is also available in person at our concerts at the Rebecca Cohn Auditorium.